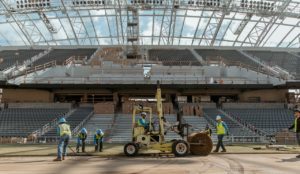 Three Los Angeles-areas venues are under construction for soccer, football and the 2028 Summer Olympics. Between the cranes, earthmovers and swarms of fluorescent vests, you’d be forgiven for mistaking the Los Angeles basin for a construction zone. Sporting-wise, there are three construction zones, including a new stadium for a Major League Soccer latest expansion franchise, the venerable Coliseum gets a much needed renovation, and a bling-y NFL stadium starts to emerge from the silt of the Angeles alluvial plain. Construction or renovation plans for all the venues were underway before the International Olympic Committee awarded the 2028 Summer Games to Los Angeles last fall; all three venues are expected to host Olympic events in a decade. Editor’s note: This profile is an excerpt from our latest STADIUM TECH REPORT issue for Spring 2018, which includes a look at Wi-Fi performance during the Final Four, a recap of wireless performance at Super Bowl 52, a profile of the Vegas Golden Knights’ T-Mobile Arena and more! DOWNLOAD YOUR FREE COPY right now from our site! Let’s take them in the order they’re expected to open. 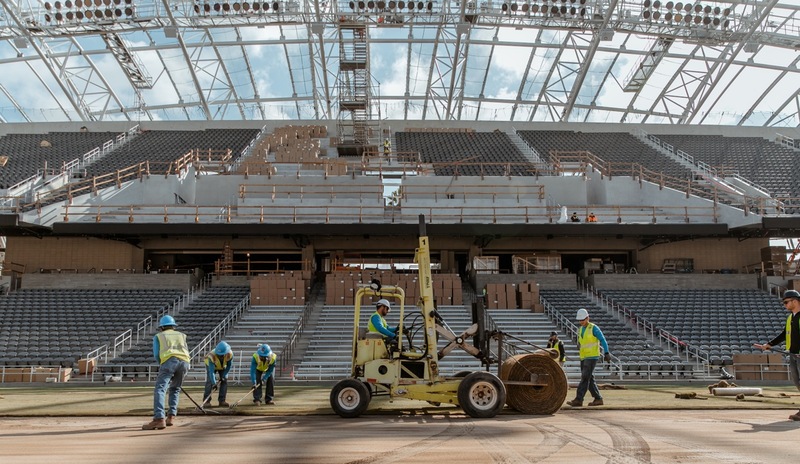 In its inaugural season, Major League Soccer’s newest franchise, Los Angeles Football Club, is moving with speed and efficiency to make sure the Banc of California Stadium is ready for LAFC’s first home game April 29. Right next door (literally) is the Los Angeles Coliseum, where demolition began in January after the NFL’s Los Angeles Rams playoff loss to Atlanta. Located on the campus of the University of Southern California, the Coliseum is home field for both the Rams (at least til 2020… more on that in a second), and the USC Trojan football team. The Coliseum has already hosted opening ceremonies for two Olympiads and is poised to do the honors again. 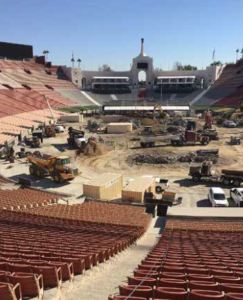 In the meantime, construction crews are working 16 hours a day, six days a week, according to Derek Thatcher, IT manager at the Coliseum and an employee of USC, which oversees and administers the venue for Los Angeles County. This is the eighth renovation of the 97-year old venue; in addition to making the bowl ADA-compliant, this latest upgrade will add more aisles and larger seats, reducing capacity from 93,607 to 77,500. New Wi-Fi is also part of the renovation plan; no word yet on which vendor will supply gear, though Mobilitie donated Aruba APs last year for use in the student section and elsewhere in the bowl. About half the Coliseum’s $270 million renovation will be done during this year’s football offseason; a new field and refurbished seats will be ready for the Rams and Trojans by late summer. Remaining construction and upgrades will be completed in the 2019 offseason, according to Coliseum officials. are taking shape. Construction crews broke ground in late 2016 to transform a 300-acre site into a gleaming new sporting destination. The $2.6 billion complex will be shared by the Rams and the Los Angeles Chargers starting in 2020; LA Stadium is scheduled host the Super Bowl in February 2022. With a capacity of 70,000 (expandable to 100,000), the stadium’s indoor/outdoor design and a two-sided, 120-yard oculus video display are already generating buzz. Site managers haven’t mentioned any network technology or which vendors they’re considering for wireless and other IT requirements. LA’s Olympic planning committee also reserved the option to use the stadium and the Coliseum for dual-venue opening and closing ceremonies in 2028. Using the Coliseum satisfies the Olympic purists; mixing in LA Stadium would provide the glitzy spectacle global audiences have come to expect from Olympics hosts. ESPN is launching 15 virtual networks for users of Apple TV and Roku boxes that provide Internet connectivity to their televisions as part of its ongoing WatchESPN initiative. The new channels’ programming will be culled from related conference programming from the network’s existing portfolio that includes ESPN, ESPN2, ESPN3, ESPNU and others. Some of the programming will include select live events including college basketball. Others such as college football will only be available via on-demand broadcasting. The channels will feature the ACC, America East, Atlantic Sun, Big South, Big West, Horizon, Mid-American, Metro Atlantic Athletic, Missouri Valley, Northeast, Ohio Valley, Southern, Sun Belt and Southland conferences. In addition there will be a combined channel featuring coverage of historically black colleges and universities (HBCU) and conferences including the Southwestern Athletic Conference, Mid-Eastern Athletic and Central Intercollegiate Athletic conferences. Fox Sports will be broadcasting a new slate of games this year, with a preference for teams that have regional Fox broadcast deals, and it will have the opportunity to highlight its games with its new MLB Whiparound show. Airing Monday-Friday at 10 pm ET (but 12 midnight on Wednesdays) the program will be up against one of ESPN’s flagship programs Baseball Tonight and the MLB Network’s MLB tonight, all of which start at the same hour. There are a few fans in Portland, Ore., who are running a campaign to get the state to encourage the Oakland Raiders to move north to Portland, a city that lost its Single A baseball team a few years ago due to lack of support. While the Raiders’ owner has said that the team would look to move if Oakland does not solve its stadium issue (it wants a new one) it seems highly unlikely that Portland would be its first choice with Los Angeles open. However the mix between Portland hipsters and die hard Raider fans would be great to watch. Advertising Age is reporting that the broadcast giant has to provide make-good ads to some of its Olympics customers because while it won the broadcast bragging rights for virtually every night it fell short of the projected ratings. However the network feels good about the overall results and is optimistic about its next Olympics broadcast, the 2016 Summer games in Rio. It has already started to sell ads for that event. One of the great things about minor league baseball are the interesting promotions that many of the teams engage in. What is possible the first of the upcoming season comes from the Kalamazoo Growlers. They are having a promotion centered around selfies called the Salute to Selfie Night this season. The event calls for fans to take pictures of themselves and submit them, from which the team will make a jersey with the images reproduced in collage form. So practice your duck face now! Screen shot of NBC live stream video with Twitter window to right (click for larger image). Even though American skiers Andrew Weibrecht and Bode Miller were fast enough to win medals in the super-G Sunday in Russia, it was Twitter outpacing NBC to the finish line during the broadcaster’s live streaming coverage from the Sochi Olympics. If you were up late in the U.S. watching the live online coverage via NBC’s Live Extra service, you could also see a window with “experts” Twitter feeds to the right of the video screen. As the super-G progressed, and as racers challenged Miller’s once-leading time, you could see race results being tweeted before they were shown via the “live” video. The spoiler effect got some Twitter users and live-stream watchers angry, and they took out their frustrations on the reporters whose tweets were being shown in NBC’s official window. In a very unofficial review yours truly has noticed that NBC is jamming a lot more commercial breaks into the online streams than they did at the start of the games — the first night of action I watched online (men’s DH) had very few commercials breaks. The super-G coverage on Sunday/Saturday, however, had numerous commercial inserts, many right before racers were about to ski. There were also some buffering and streaming hiccups, which may be a result of my own connection and not NBC’s fault. Maybe it’s hard to blame NBC for the lure of trying to pump more advertising in; according to NBC press releases that come along almost daily now, the live streams are extremely popular and will probably become more so as the big-ticket events like men’s hockey and women’s figure skating get seriously underway. But at some point during the super-G, because of the ads or because of physics, the Twitter feed on NBC’s page got well ahead of the event, and I had to resort to the full-screen option to keep the Twitter feed from playing spoiler. While we have messages and emails out to the reporters/tweeters and NBC to try and figure out the particulars, we can pretty much guess what happened — NBC probably had no buffer or filter in place at all, and the speed of 140 characters is going to beat video bits (which need encoding to traverse the interwebs) every time. It is most likely an early-days problem of trying to do something ambitious like live stream every event, an undertaking NBC should be commended for. But with all the resources at its disposal and all its social media savvy, NBC should have forseen this kind of glitch. In this age of reporters tweeting from events there is always the problem of Twitter moving faster than even official broadcasts — but you rarely see a network spoil its own show with official Tweets that move faster than its own “live” video. For us here at MSR it’s a glitch we can live with, since efforts to stymie the speed of Twitter are as futile as they are worthless. The easy solution will be to restrict or delay the Twitter feed, which will cripple the instant-feedback usefulness of Twitter. 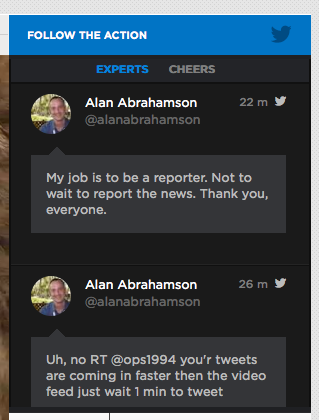 More live Twitter and more live video is what we say. But the glitch is also evidence that the desire to blend video and social media on the same viewing page may not always produce the results you are looking for. Maybe better design is the answer? And sorry if we are playing spoiler for NBC’s prime time show later Sunday but hey, two medals in one race is pretty big news for the U.S. Ski Team, and what a killer effort from the old man Bode. And tying for a bronze — well that’s just a pretty Bode result too. And here’s an Instagram to show the proud teammates posing with the flag after their second- and third-place finishes. Everybody has that one friend that always manages to drink most of the beer in your fridge and never seems to bring any to replace it. It looks like the Olympics have that problem but at least one nation has come up with an innovative way to keep the beer available only for those who have a right to it. In the Team Canada athletes compound the only way you can get the beer fridges to open is to have your Canadian passport scanned in order to get a cold Molson. I wonder if they are marketing this technology to home owners? It seems like a very dim memory now, but at one time Rick Reilly was one of the must reads in sports. And if you did read him religiously in the past there is probably no reason to read him now as it seems that he is increasingly plagiarizing himself in his latest work. It has gotten so bad for the ESPN columnist that now when people report on his latest transgressions they have a large selection of past examples to bring up. Aside from this he has been embarrassed by Fox Sports 1 announcers, misquoted his father-in-law and complained that he did not get credit for a Twitter news item. What may be even worse is that satire on the subject looks real. ESPN touts itself as the worldwide leader in sports and one of the methods that the sports network is now reaching out to fans is via apps for mobile devices. Most sports fans that I know have the general ESPN app on their phone but that is just the start. There are a range of apps that are locally targeted with the first five covering Los Angeles, Dallas, Boston, Chicago and New York. ESPN has released the lineup of games that it will be broadcasting for this years Spring Training slate and if you are not a fan of the Yankees and Red Sox you are very likely to be uninterested in this heavily slanted broadcast schedule. There will only be seven games and two of them are featuring the Yankees-Red Sox, and the Cactus League, that serves teams from San Francisco, Los Angeles and Chicago, apparently does not exist to the network as it has been shut out, again. BASE jumping is the sport of leaping off tall structures, so is there a name for climbing them? Well even if there is not it is quite an achievement and the video for the guys that climbed the Shanghai Towers shows how hard it is. The tower is 650 meters, or 2,132 feet, and these two men did it with their bare hands. I wonder what the winds are like at that height on a building? If imitation is the highest form of flattery then Felix Baumgartner, the man who jumped from space, must be very flattered that his action is being imitated by climber Joby Ogwyn who will do a similar stunt, this time from the top of the world’s highest peak. If all goes as planned the Discovery Channel will be broadcasting the feat on live TV this May as it covers the last stage of Ogwyn’s climb and subsequent jump. It is expected to cover five miles and feature three stages. It will be covered by 15 cameras including some that are mounted in the wing suit. Tim Tebow to be face of A-11 League? Now there are reports that one of the teams, not surprisingly based in Tampa, is looking to give Tim Tebow a shot at redemption by selecting him as its quarterback. A league official said that Tebow would become the face of the league. If you had CBS as the station that would win the bidding war for new Thursday Night Football games step up and accept your prize! The channel will be airing eight games this upcoming season, which will be simulcast with the NFL Network broadcast. The NFL Network will also exclusively show eight late season games. Then there is the expansion to Saturday, where the league will show two games on Dec. 20, Week 16 of the season and after all of the bye weeks have passed for the teams. The kickoff times and teams are still being determined. While the current Olympics in Sochi are getting a good deal of grief prior to the opening ceremony you have to wonder what people would be saying if the games imitated on that took place over 100 years ago? The Smithsonian has an interesting piece on the games that took place in 1904 in St Louis, Mo. and specifically on the top event, the Marathon. One feature was that they intentionally allowed the athletes to become dehydrated during the run to see what effect that would have. It appears that all but eight stadiums in MLB have a corporate sponsor, and with the Texas Rangers selling the naming rights to Globe Life and Accident Insurance Co. there are now only nine without an extended title that just rolls off of your tongue. Yet just 20 years ago, according to the Consumerist, there was only one that had a sponsor name while most were simply named for their location and one, San Diego’s Jack Murphy Stadium, was even named after a sports writer of all things. Take a look at how some of the names have undergone change in the last two decades. Friday Grab Bag: Apple Watch, Smaller Surface Tablets? The New York Times has reported that Apple is developing a watch that will run the same operating system as its popular iPhones and iPads, iOS. That is about the sum total of the information provided but it is fun to think of all of the interesting things that you can do with such a device. I suspect schools will not be looking forward to students having access to answers via such a device. Smart watches have been in vogue for the last few years, with Kickstarter favorite Pebbles probably leading the pack. There is also a range of task specific watches for activities such as golf, biking and other outdoor activities. What do wrestling, softball and baseball have in common? Well for one they have all been dropped as Olympic sports, with a final vote now pending to drop wrestling starting with the 2020 games. The other two sports were dropped in 2005. Still there is a line of sports seeking to be allowed at the Olympics including baseball and softball, which are seeking reinstatement. Others include karate, roller sports, squash, sport climbing and wakeboarding while rugby and golf have made the cut and will be played at the next games in 2016. Users of Nike’s Nike+ Fuelband are being left out if they are also users of an Android smartphone as the company has said that it will not be developing apps for that platform in the near future, but will stay the course by continuing to support Apple’s iOS. Nike tweeted the news, which was reported by a number of outlets such as Engadget, and said that it will be focusing both on the Apple side of things and that users can also use nikeplus.com to sync their activity. Microsoft to have smaller sized Surface tablets? Microsoft’s chief financial officer Peter Klein hinted that the company was looking at developing next generation Surface tablets in a wide array of new sizes at the recent Goldman Sachs Technology and Internet Conference, according to geek.com. He said that the company was prepared to meet demand from its customer base and that anything from 4-inches to 13 inches are on the table. The company had slow sales for its Surface RT models but appears to have strong sales in the Surface Pro lineup, particularly at the high end. Users of Apple’s iPad and iPhone devices that have its iOS 6.1 operating system might have noticed that the operating system appears to have issues with Microsoft’s Exchange servers. Well it looks like Apple is acknowledging the issue and has a fix in the works. Issues such as reoccurring calendar items and excessive calling back to the servers and thus killing battery life were two of the principal issues associated with the bug.